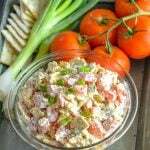 An easy Southern appetizer, snack, or lunch- this 'salad' features garden fresh tomatoes, buttery crackers, and sliced green onions in a creamy mayo dressing- like a deconstructed tomato sandwich. To a medium sized mixing bowl, add the tomatoes & mayo. Gently stir, just until evenly incorporated and the tomatoes are well coated. Salt & pepper, to taste, but using much more pepper than salt. Stir in the crackers & onions, again just until evenly incorporated. Serve right away, either as is or with lettuce leaves for wraps.